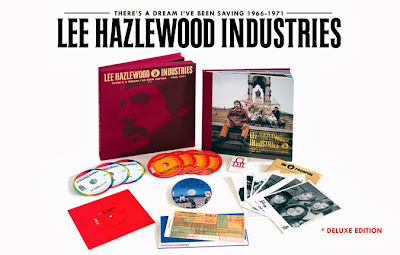 Discussions Magazine Music Blog: LEE HAZLEWOOD INDUSTRIES/There's A Dream I've Been Saving 1966-71: unleashed on November 26th, 2013! LEE HAZLEWOOD INDUSTRIES/There's A Dream I've Been Saving 1966-71: unleashed on November 26th, 2013! Deluxe Edition housed in a cloth-bound clamshell box with reproductions of LHI-era artifacts including press photos and a reproduction plane ticket used by Hazlewood back in ‘70. But the true icing on the cake is three data discs which include just about every 45 single and every LP ever released on LHI in both WAV and MP3 formats. At around 17 albums and 72 singles (totaling 305 songs! ), that’s a whole lot of Lee. 2013 five disc (four CDs + DVD) book/box set. This landmark box set is the ultimate artifact for Lee Hazlewood heads new and old, containing a lavishly packaged, expansive 172-page LP sized hard cover book. But every good book deserves a soundtrack and in this case it comes in the form of a four CD anthology of the LHI label, along with the never-before-released 1970 film Cowboy In Sweden on DVD. One of the most impressive aspects of the LHI box set is the gorgeous 12''x12'' LP sized book, packed with rare beautiful pictures of Lee, his artists (and the occasional horse). The pages roll out the full story of the LHI label, including interviews with Lee and Suzi Jane Hokum, re-assessments of key Hazlewood albums, and artist profiles for the label’s roster, lovingly written by renowned L.A. music journalist/novelist Jessica Hundley. In the illuminating text, a picture of Hazlewood emerges - fiercely talented, brutally independent, a rare, ornery, ruthless and visionary man. This landmark box set is the ultimate artifact for Lee Hazlewood heads new and old, containing a lavishly packaged, expansive 172-page LP sized hard cover book. But every good book deserves a soundtrack and in this case it comes in the form of a four-CD anthology of the LHI label, along with the never-before-released 1970 film Cowboy In Sweden on DVD. One of the most impressive aspects of the LHI box set is the gorgeous 12''x12'' LP sized book, packed with rare beautiful pictures of Lee, his artists (and the occasional horse). The pages roll out the full story of the LHI label, including interviews with Lee and Suzi Jane Hokum, re-assessments of key Hazlewood albums, and artist profiles for the label’s roster, lovingly written by renowned L.A. music journalist/novelist Jessica Hundley. In the illuminating text, a picture of Hazlewood emerges - fiercely talented, brutally independent, a rare, ornery, ruthless and visionary man.